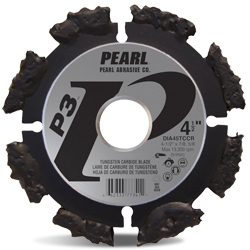 P3 Random Tungsten Carbide Blade for removal of hard to semi-hard joint sealant from concrete and masonry expansion joints! Tungsten carbide welded permanently on blade’s steel core. Cuts through material which conventional diamond or abrasive wheels can't! Cuts through joint sealant - without melting the sealant or loading. Carbide blade that cuts felt and paper type expansion joints, hard caulk, rubber, plastic and drywall. To re-sharpen a blade, reverse the rotation direction of the blade. Max RPM: 12,250. Dry cutting.